American Airlines Flight 11 was a domestic passenger flight that was hijacked by five al-Qaeda members on September 11, 2001, as part of the September 11 attacks. Mohamed Atta deliberately crashed the plane into the North Tower of the World Trade Center in New York City, killing all 92 people aboard and an unknown number in the building's impact zone. The aircraft involved, a Boeing 767-223ER, registration N334AA, was flying American Airlines' daily scheduled morning transcontinental service from Logan International Airport in Boston to Los Angeles International Airport in Los Angeles. North Tower of the World Trade Center, New York City, U.S.
Fifteen minutes into the flight, the hijackers injured at least three people (possibly killing one), forcibly breached the cockpit, and overpowered the captain and first officer. Atta, an al-Qaeda member and licensed commercial pilot, took over the controls. Air-traffic controllers noticed the flight was in distress when the crew was no longer responding. They realized the flight had been hijacked when Mohamed Atta's announcements for passengers were transmitted to air traffic control. On board, flight attendants Amy Sweeney and Betty Ong contacted American Airlines, and provided information about the hijackers and injuries to passengers and crew. The aircraft crashed into the North Tower of the World Trade Center at 08:46:40 local time. Countless people in the streets of New York City witnessed the strike, but few video recordings captured the moment. Documentary film maker Jules Naudet captured the only known footage of the initial impact from start to finish. Before the hijacking was confirmed, news agencies began to report on the incident and speculated that the crash had been an accident. The impact and subsequent fire caused the North Tower to collapse 102 minutes after the crash, resulting in hundreds of additional casualties. During the recovery effort at the World Trade Center site, workers recovered and identified dozens of remains from Flight 11 victims, but many body fragments could not be identified. N334AA, the aircraft involved, taxiing at Manchester Airport on April 8, 2001, five months before the attacks. The American Airlines Flight 11 aircraft was a Boeing 767-200ER delivered in 1987, registration number N334AA. The capacity of the aircraft was 158 passengers, but the September 11 flight carried 81 passengers and 11 crew members. This was a light load at 58.2 percent capacity, but higher than the average load factor for Flight 11 on Tuesday mornings of 39 percent in the months preceding September 11. The 11 crew members were Captain John Ogonowski, First Officer Thomas McGuinness, and flight attendants Barbara Arestegui, Jeffrey Collman, Sara Low, Karen Martin, Kathleen Nicosia, Betty Ong, Jean Roger, Dianne Snyder, and Amy Sweeney. All 92 people on board were killed, including David Angell (the creator and executive producer of the television sitcom Frasier), his wife Lynn Angell, and actress Berry Berenson, the widow of Anthony Perkins. Family Guy creator Seth MacFarlane had been scheduled to be on the flight but arrived at the airport late. Actor Mark Wahlberg was also scheduled to be on the flight but canceled his ticket at the last minute. Actress Leighanne Littrell, wife of Backstreet Boys singer Brian Littrell, had also previously been booked on the flight but, like Wahlberg, changed her plans at the last minute. Mohamed Atta, the ringleader of the attacks, and a fellow hijacker, Abdulaziz al-Omari, arrived at Portland International Jetport at 05:41 Eastern Daylight Time on September 11, 2001. They boarded Colgan Air Flight 5930, which was scheduled to depart at 06:00 from Portland, Maine, and fly to Boston. Both hijackers had first class tickets with a connecting flight to Los Angeles; Atta checked in two bags, Omari none. When they checked in, the Computer-Assisted Passenger Prescreening System (CAPPS) selected Atta for extra luggage scrutiny, but he boarded without incident. The flight from Portland departed on time and arrived in Boston at 06:45. Three other hijackers, Waleed al-Shehri, Wail al-Shehri, and Satam al-Suqami, arrived at Logan Airport at 06:45, having left their rental car in the airport parking facility. At 06:52, Marwan al-Shehhi, the hijacker pilot of United Airlines Flight 175, made a call from a pay phone in Logan Airport to Atta's cell phone. Since they were not given boarding passes for Flight 11 in Portland, Atta and Omari checked in and went through security in Boston. In the rushed check-in after the flight from Portland, airline officials did not load Atta's bags on Flight 11. Suqami, Wail al-Shehri, and Waleed al-Shehri also checked in for the flight in Boston. Wail al-Shehri and Suqami each checked one bag; Waleed al-Shehri did not check any bags. CAPPS selected all three for a detailed luggage check. As the CAPPS' screening was only for luggage, the three hijackers did not undergo any extra scrutiny at the passenger security checkpoint. By 07:40, all five hijackers were aboard the flight, scheduled to depart at 07:45. Mohamed Atta sat in business class seat 8D with Abdulaziz al-Omari in 8G and Suqami in 10B. Waleed al-Shehri and Wail al-Shehri sat in first class seats 2B and 2A. At 07:46, one minute behind schedule, the aircraft received clearance to push back from Gate B32, and was cleared to taxi to the runway at 07:50. The aircraft began its takeoff run from Logan International Airport at 07:59 from runway 4R. "Okay, my name is Betty Ong. I'm [Flight Attendant] Number 3 on Flight 11. Our Number 1 got stabbed. Our purser is stabbed. Nobody knows who stabbed who and we can't even get up to business class right now because nobody can breathe. And we can't get to the cockpit, the door won't open." - Flight attendant Betty Ong to the American Airlines emergency line. The 9/11 Commission estimated that the hijacking began at 08:14, when the pilots stopped responding to requests from the Boston Air Route Traffic Control Center (Boston ARTCC). Waleed al-Shehri made the first move. At 08:13:29, as the aircraft was passing over central Massachusetts at 26,000 feet (7,900 m), the pilots responded to a request from Boston ARTCC to make a 20-degree turn to the right. At 08:13:47, Boston ARTCC told the pilots to ascend to a cruising altitude of 35,000 feet (11,000 m) but received no response. It is believed that Captain Ogonowski was stabbed to death in order for the hijacker pilot Mohamed Atta to take control of the plane and crash it into the North Tower of the World Trade Center. Before dying, Ogonowski keyed the cockpit microphone; "pushing its button intermittently to signal that something was wrong and at one point allowing them to hear the voice of the hijacker." At 08:16, the aircraft leveled off at 29,000 feet (8,800 m) and shortly thereafter deviated from its scheduled path. Boston ARTCC made multiple attempts to talk to Flight 11 without reply, and at 08:21, the flight stopped transmitting its Mode-C transponder signal. According to flight attendants Amy Sweeney and Betty Ong, who contacted American Airlines during the hijacking, the hijackers had stabbed flight attendants Karen Martin and Barbara Arestegui and slashed the throat of passenger Daniel Lewin. Lewin, an American-Israeli Internet entrepreneur who understood Arabic, had served as an officer in the elite Sayeret Matkal special operations unit of the Israel Defense Forces. Lewin was seated in 9B, and Suqami was directly behind him in 10B. The 9/11 Commission suggested that Suqami may have stabbed and killed Lewin after he attempted to stop the hijacking. Lewin is believed to be the first fatality in the 9/11 attacks. During a four-minute call to the American Airlines operations center, Ong provided information about lack of communication with the cockpit, lack of access to the cockpit, and passenger injuries. She provided the seat locations of the hijackers, which later helped investigators to determine their identities. At 08:24:38, Atta tried to make an announcement to the passengers, but pressed the wrong button and sent the message to Boston ARTCC. Air traffic controllers heard Atta announce, "We have some planes. Just stay quiet and you'll be O.K. We are returning to the airport." At 08:24:56, he announced "Nobody move. Everything will be okay. If you try to make any moves, you'll endanger yourself and the airplane. Just stay quiet." As before, Atta thought he was speaking to only the passengers, but his voice was picked up and recorded by air traffic controllers. After the transmissions by Atta and the inability to contact the airliner, air traffic controllers at Boston ARTCC realized the flight had been hijacked. At 08:26, the plane turned south. At 08:32, the Federal Aviation Administration (FAA) Command Center in Herndon, Virginia, notified FAA headquarters. At 08:33:59, Atta announced, "Nobody move, please. We are going back to the airport. Don't try to make any stupid moves." At 08:37:08, the pilots of United Airlines Flight 175 verified Flight 11's location and heading to flight control. Boston ARTCC bypassed standard protocols and directly contacted the North American Aerospace Defense Command (NORAD) Northeast Air Defense Sector (NEADS) in Rome, New York. NEADS called on two F-15 fighter jets at Otis Air National Guard Base in Mashpee, Massachusetts, to intercept. Officials at Otis spent a few minutes getting authorization for the fighters to take off. Atta completed the final turn towards Manhattan at 08:43. The order to dispatch the fighters at Otis was given at 08:46, and the F-15s took off at 08:53, roughly seven minutes after American Airlines Flight 11 had already crashed into the North Tower of the World Trade Center. Of the four hijacked aircraft on 9/11, the nine minutes of advance notification about the hijacking of Flight 11 was the most time that NORAD had to respond before the aircraft crashed into its target. At 08:46:30, Mohamed Atta intentionally crashed American Airlines Flight 11 into the northern façade of the North Tower (Tower 1) of the World Trade Center. The aircraft, traveling at about 404 knots (465 mph; 748 km/h) and carrying about 10,000 U.S. gallons (38,000 L) of jet fuel, hit between the 93rd and 99th floors of the North Tower. Jules Naudet filmed the impact of Flight 11 as it crashed into the North Tower of the World Trade Center. We were under the impression – he looked like he was going down, but we didn't hear any mechanical difficulty. We couldn't figure out why an American Airlines plane would be so low in downtown Manhattan. We sort of expected him to veer off and go into the Hudson. But he just rose a little bit, his altitude, leveled off, and he was headed straight for the Trade Center. So just before he got to the Trade Center, it seemed as though he gained power. We were just watching this airplane on target for the World Trade Center. All of a sudden, boom! He disappears into the Trade Center. The damage caused to the North Tower destroyed any means of escape at the impact zone or above it. All stairwells and elevators from the 92nd floor up were rendered impassable, trapping 1,344 people. According to the Commission Report, hundreds were killed instantly by the impact; the rest were trapped and died from the subsequent fire and smoke, the eventual collapse, or (in some cases) after jumping or falling from the building. Elevator shafts channeled burning jet fuel through the building. At least one elevator shaft carried burning fuel downward, exploding on the 77th floor, the 22nd floor, and at street level on the West Side Lobby. Jules Naudet, a French cameraman, and Pavel Hlava, a Czech immigrant, videotaped the crash. A webcam set up by Wolfgang Staehle at an art exhibit in Brooklyn to take images of Lower Manhattan every four seconds also captured images of Flight 11 crashing into the North Tower. A WNYW newscamera left rolling on the ground also captured audio of the crash and video of the immediate aftermath. Yeah. This just in: you are looking at, obviously, a very disturbing live shot there. That is the World Trade Center, and we have unconfirmed reports this morning that a plane has crashed into one of the towers of the World Trade Center. CNN Center right now is just beginning to work on this story, obviously calling our sources and trying to figure out exactly what happened, but clearly something relatively devastating happening this morning there on the south end of the island of Manhattan. That is once again, a picture of one of the towers of the World Trade Center. Later, in an on-air phone call from his office at the CNN New York bureau, CNN vice-president of finance Sean Murtagh reported that a large passenger commercial jet had hit the World Trade Center. Eventually, other television networks interrupted regular broadcasting with news of the crash. President George W. Bush was arriving at Emma E. Booker Elementary School in Sarasota, Florida. Initial news reports speculated that the crash had been an accident until United Airlines Flight 175 was flown into the South Tower 17 minutes after Flight 11 made impact. The names of Flight 11's crew are located on Panel N-74 of the National September 11 Memorial's North Pool. The passenger names are inscribed on that panel and four other adjacent ones. After the crash, the North Tower burned for 102 minutes before collapsing at 10:28 A.M. Although the impact itself caused extensive structural damage, the long-lasting fire ignited by jet fuel was blamed for the structural failure of the tower. In addition to the aircraft passengers and building occupants, hundreds of rescue workers also died when the tower collapsed. Cantor Fitzgerald L.P., an investment bank on floors 101–105 of the World Trade Center One, lost 658 employees, considerably more than any other employer. Rescue workers at the World Trade Center site began to discover body fragments from Flight 11 victims within days of the attack. Some workers found bodies strapped to airplane seats and discovered the body of a flight attendant with her hands bound, suggesting the hijackers might have used plastic handcuffs. Within a year, medical examiners had identified the remains of 33 victims who had been on board Flight 11. They identified two other Flight 11 victims, including purser Karen Martin, in 2006, while other unrelated body fragments were discovered near Ground Zero around the same time. In April 2007, examiners using newer DNA technology identified another Flight 11 victim. The remains of two hijackers, potentially from Flight 11, were also identified and removed from Memorial Park in Manhattan. The remains of the other hijackers have not been identified and are buried with other unidentified remains at this park. Suqami's passport survived the crash and landed in the street below. Soaked in jet fuel, it was picked up by a passerby who gave it to a New York City Police Department (NYPD) detective shortly before the South Tower collapsed. Investigators retrieved Mohamed Atta's luggage, which had not been loaded onto the flight. In it they found Omari's passport and driver's license, a videocassette for a Boeing 757 flight simulator, a folding knife, and pepper spray. In a recording, a few months later in Afghanistan, Al Qaeda's leader, Osama bin Laden, took responsibility for the attack. The attack on the World Trade Center exceeded even bin Laden's expectations: he had expected only the floors above the plane strikes to collapse. The flight recorders for Flight 11 and Flight 175 were never found. After the attacks, the flight number for flights on the same route with the same takeoff time was changed to American Airlines Flight 25. These flights now use a Boeing 737-800 instead of a Boeing 767. An American flag is flown on the jet bridge of gate B32 from which Flight 11 departed Logan Airport. On April 26, 2013, a piece of the wing flap mechanism from a Boeing 767 was discovered wedged between two buildings at Park Place, near where other landing gear parts were found. 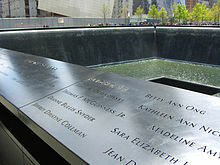 At the National September 11 Memorial, the names of the 87 victims of Flight 11 are inscribed on the North Pool, on Panels N-1 and N-2, and Panels N-74 – N-76. ^ "FAA Registry (N334AA)". Federal Aviation Administration. ^ "Brief of Accident". National Transportation Safety Board. March 7, 2006. Archived from the original (PDF) on May 31, 2010. Retrieved May 5, 2007. ^ a b c d "Staff Report – "We Have Some Planes": The Four Flights — a Chronology" (PDF). National Commission on Terrorist Attacks Upon the United States. Archived from the original (PDF) on October 24, 2012. Retrieved May 25, 2008. ^ "American Airlines Flight 11". CNN. 2001. Archived from the original on May 16, 2008. Retrieved May 22, 2008. ^ Lagos, Marisa; Walsh, Diana (September 11, 2006). "S.F. firefighters, others honor peers who died on 9/11". San Francisco Chronicle. Archived from the original on March 14, 2012. Retrieved May 23, 2008. ^ "American Airlines Flight 11 – Victims". CNN. Archived from the original on May 16, 2008. Retrieved June 6, 2008. ^ Weinraub, Bernard (July 7, 2004). "The Young Guy Of 'Family Guy'; A 30-Year-Old's Cartoon Hit Makes An Unexpected Comeback". The New York Times. Retrieved October 4, 2011. ^ "Mark Wahlberg sorry for saying he would have thwarted 9/11 terrorists". Fox News. January 18, 2012. Archived from the original on November 2, 2013. ^ Copley, Rich. "Backstreet Boy feels victims' families' pain | Flight 5191: Stories from Sept. 2-21, 2006". Kentucky.com. Retrieved July 3, 2013. ^ "Extract: 'We have some planes'". BBC News. July 23, 2004. Archived from the original on December 16, 2008. Retrieved May 22, 2008. ^ a b c d e f g h i "'We Have Some Planes'". National Commission on Terrorist Attacks Upon the United States. July 2004. Archived from the original on May 11, 2008. Retrieved May 25, 2008. ^ Kehaulani Goo, Sara (February 13, 2005). "Papers Offer New Clues On 9/11 Hijackers' Travel". The Washington Post. Retrieved May 22, 2008. ^ a b "Excerpts From Statement by Sept. 11 Commission Staff". The New York Times. June 17, 2004. Archived from the original on November 14, 2013. Retrieved May 24, 2008. ^ a b "Investigating 9–11 – The doomed flights". San Francisco Chronicle. July 23, 2004. Archived from the original on May 23, 2012. Retrieved May 22, 2008. ^ "The Aviation Security System and the 9/11 Attacks – Staff Statement No. 3" (PDF). National Commission on Terrorist Attacks Upon the United States. Archived (PDF) from the original on May 28, 2008. Retrieved May 25, 2008. ^ "9/11 Investigation (PENTTBOM)". Federal Bureau of Investigation. United States Department of Justice. September 2001. Archived from the original on May 14, 2008. Retrieved May 22, 2008. ^ "Transcripts of Flight 11 and Flight 175" The New York Times, October 16, 2001, Retrieved December 3, 2009. ^ Johnson, Glen (November 23, 2001). "Probe reconstructs horror, calculated attacks on planes". The Boston Globe. Archived from the original on December 2, 2012. ^ a b c d e f g h i "Flight Path Study – American Airlines Flight 11" (PDF). National Transportation Safety Board. February 19, 2002. Archived from the original (PDF) on February 1, 2009. Retrieved May 25, 2008. ^ "Transcript". Bill Moyers Journal. Public Broadcasting Service. September 14, 2007. Archived from the original on April 27, 2008. Retrieved May 24, 2008. ^ Kifner, John (September 13, 2001). 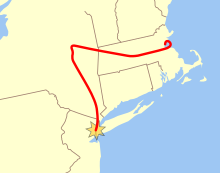 "AFTER THE ATTACKS: AMERICAN FLIGHT 11; A Plane Left Boston and Skimmed Over River and Mountain in a Deadly Detour". New York Times. Retrieved March 30, 2018. ^ Toby Harnden (September 13, 2001). "Hijackers reassured pilot while they stabbed stewardesses". The Telegraph. Retrieved March 10, 2010. ^ "Excerpt: A travel day like any other until some passengers left their seats". The Seattle Times. July 23, 2004. Archived from the original on November 19, 2011. Retrieved May 23, 2008. ^ "Inside the failed Air Force scramble to prevent the Sept. 11 attacks". MSNBC. June 28, 2004. Archived from the original on September 18, 2009. Retrieved May 23, 2008. ^ Woolley, Scott (April 23, 2007). "Video Prophet". Forbes. Archived from the original on December 16, 2008. Retrieved May 23, 2008. ^ Hersh, Seymour M. (October 29, 2001). "Watching the Warheads: The Risks to Pakistans Nuclear Arsenal", The New Yorker. ^ a b Sisk, Richard; El-Faizy, Monique (July 24, 2004). "First Victim Died A Hero On Flt. 11 Ex-Israeli commando tried to halt unfolding hijacking". Daily News. Retrieved May 23, 2008. ^ Eggen, Dan (March 2, 2002). "Airports Screened Nine of Sept. 11 Hijackers, Officials Say; Kin of Victims Call for Inquiry into Revelation". The Washington Post. ^ a b Sullivan, Laura (January 28, 2004). "9/11 victim calmly describes hijack on haunting tape". The Baltimore Sun. Retrieved May 22, 2008. ^ "Flight Path Study - American Airlines Flight 11" (PDF). www.ntsb.gov. ^ a b "9/11 recordings chronicle confusion, delay". CNN. June 17, 2004. Archived from the original on October 29, 2013. Retrieved May 24, 2008. ^ Ellison, Michael (October 17, 2001). "'We have planes. Stay quiet' – Then silence". The Guardian. London. Archived from the original on June 17, 2008. Retrieved May 26, 2008. ^ NEADS/NORAD (the military) was notified about Flight 11 at 8:37 a.m., nine minutes before the crash. This nine minutes was the amount of time available to them to respond to the situation. They were notified about United Airlines Flight 175 at 9:03 a.m., the same time it crashed into the South Tower. They were notified about American Airlines Flight 77 four minutes before it crashed into the Pentagon. The military was notified about United Airlines Flight 93 at 10:07 a.m. (four minutes after it crashed in Pennsylvania). The nine minutes with Flight 11 was the most time they had to do something in response. Source: Kean, Thomas H.; Hamilton, Lee H. "The Story in the Sky". Without Precedent. Alfred A. Knopf. p. 263. ISBN 978-0-307-26377-3. ^ Gero, David (2009). Aviation Disasters, The world's major civil airliner crash since 1950. The History Press. p. 326. ISBN 978-0-7524-5039-1. ^ McAllister, T. P.; Gann, R. G.; Averill, J. D.; Gross, J. L.; Grosshandler, W. L.; Lawson, J. R.; McGrattan, K. B.; Pitts, W. M.; Prasad, K. R.; Sadek, F. H.; Nelson, H. E. (August 2008). Structural Fire Response and Probable Collapse Sequence of World Trade Center Building 7 (Volume 1). 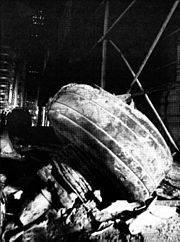 Federal Building and Fire Safety Investigation of the World Trade Center Disaster (NIST NCSTAR 1–9). National Institute of Standards and Technology (NIST). pp. 1–8. Archived from the original on November 2, 2013. Retrieved September 9, 2011. ^ "NIST NCSTAR1-5: Reconstruction of the Fires in the World Trade Center Towers" (PDF). National Institute of Standards and Technology. October 2005. Archived (PDF) from the original on May 30, 2008. Retrieved May 25, 2008. ^ "World Trade Center Task Force Interview – Lieutenant William Walsh" (PDF). The New York Times. January 11, 2002. Archived (PDF) from the original on May 30, 2008. Retrieved May 28, 2008. ^ a b Dwyer, Jim; Lipton, Eric; et al. (May 26, 2002). "102 Minutes: Last Words at the Trade Center; Fighting to Live as the Towers Die". The New York Times. Archived from the original on November 14, 2013. Retrieved May 23, 2008. ^ "Heroism and Horror". National Commission on Terrorist Attacks upon the United States. 2004. Archived from the original on August 15, 2007. Retrieved August 18, 2007. ^ Cauchon, Dennis; Moore, Martha T. (September 4, 2002). "Elevators were disaster within disaster". USA Today. Retrieved May 23, 2008. ^ Hamburger, Ronald; et al. (May 2002). "World Trade Center Building Performance Study" (PDF). FEMA. New York, New York: Federal Emergency Management Agency. 403: 19. Archived (PDF) from the original on May 27, 2008. Retrieved May 24, 2008. ^ Carter, Bill (February 6, 2002). "CBS to Broadcast Videotape Shot Inside Towers During Trade Center Attack". The New York Times. Archived from the original on December 25, 2013. Retrieved May 23, 2008. ^ Glanz, James (September 7, 2003). "A Rare View of 9/11, Overlooked". The New York Times. Archived from the original on May 3, 2009. Retrieved May 23, 2008. ^ Staehle, Wolfgang. "Rare Scenes from 9/11". Vanity Fair. Archived from the original on December 15, 2013. Retrieved June 12, 2007. ^ a b "CNN Breaking News Terrorist Attack on United States". CNN. September 11, 2001. Archived from the original on July 5, 2008. Retrieved May 23, 2008. ^ "North Pool: Panel N-74 – John A. Ogonowski". National September 11 Memorial & Museum. Archived from the original on July 27, 2013. Retrieved December 11, 2011. ^ National Construction Safety Team (September 2005). "Executive Summary". Final Report on the Collapse of the World Trade Center Towers (PDF). National Institute of Standards and Technology. United States Department of Commerce. Archived (PDF) from the original on May 27, 2008. Retrieved May 21, 2008. ^ Miller, Bill (May 1, 2002). "Report Assesses Trade Center's Collapse". The Washington Post. Retrieved June 12, 2008. ^ Williams, Timothy (April 5, 2005). "Report on Trade Center Collapses Emphasizes Damage to Fireproofing". The New York Times. Archived from the original on January 7, 2012. Retrieved June 12, 2008. ^ "Cantor rebuilds after 9/11 losses". BBC. September 4, 2006. Archived from the original on April 6, 2008. Retrieved May 20, 2008. ^ Sachs, Susan (September 15, 2001). "After the Attacks: The Trade Center; Heart-Rending Discoveries as Digging Continues in Lower Manhattan". The New York Times. Archived from the original on December 25, 2013. Retrieved May 24, 2008. ^ Gardiner, Sean; Rayman, Graham (September 15, 2001). "Hijackers May Have Used Handcuffs". AM New York. Archived from the original on March 27, 2007. Retrieved May 24, 2008. ^ O'Shaughnessy, Patrice (September 11, 2002). "More Than Half Of Victims Id'd". Daily News. New York. Archived from the original on August 25, 2009. Retrieved May 24, 2008. ^ Brubaker, Bill (November 2, 2006). "Remains of Three 9/11 Victims Identified". The Washington Post. Retrieved May 24, 2008. ^ Holusha, John (November 2, 2006). "3 Trade Center Victims Identified by DNA". The New York Times. Retrieved May 24, 2008. ^ Gaskell, Stephanie (April 11, 2007). "9/11 Plane Passenger Id'd". New York Post. Archived from the original on October 24, 2012. Retrieved September 12, 2011. ^ Kelley, Tina (March 1, 2003). "Officials Identify Remains of Two Hijackers Through DNA". The New York Times. Archived from the original on December 25, 2013. Retrieved May 24, 2008. ^ Standora, Leo (March 1, 2003). "ID Remains OF 2 WTC Hijackers". Daily News. New York. Archived from the original on August 25, 2009. Retrieved May 24, 2008. ^ "Chronology". Monograph on 9/11 and Terrorist Travel (PDF). National Commission on Terrorist Attacks Upon the United States. p. 40. Archived (PDF) from the original on May 29, 2008. Retrieved May 25, 2008. ^ "Hijackers Timeline" (PDF). Federal Bureau of Investigation / 911myths.com. Archived from the original (PDF) on May 30, 2008. Retrieved May 26, 2008. ^ "Transcript of Bin Laden videotape". National Public Radio. December 13, 2001. Archived from the original on May 12, 2008. Retrieved May 24, 2008. ^ "9-11 Commission Report – Notes". National Commission on Terrorist Attacks Upon the United States. 2004. Note 76. Archived from the original on May 30, 2008. Retrieved May 24, 2008. ^ Guzman, Dan (September 8, 2016). "At Logan, Some 9/11 Tributes Go Unnoticed By Most Of The Flying Public". www.wbur.org. Retrieved December 2, 2018. ^ Goldstein, Joseph (April 26, 2013). "11 Years Later, Debris From Plane Is Found Near Ground Zero". The New York Times. Archived from the original on April 17, 2014. ^ Goodman, J. David (April 29, 2013). 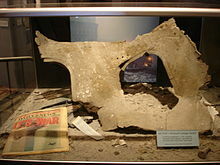 "Jet Debris Near 9/11 Site Is Identified as Wing Part". The New York Times. Archived from the original on January 4, 2014. Wikimedia Commons has media related to American Airlines Flight 11. "Victims of the American Airlines Flight 11". Archived from the original on January 12, 2010. Retrieved November 20, 2007.